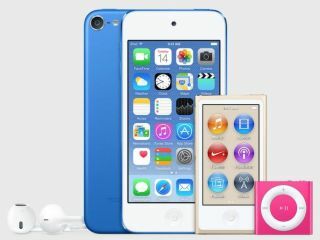 New Apple iPod colours could be launched this month | What Hi-Fi? An image showing the iPod line-up in unreleased colours has appeared in the latest version of iTunes. Apple could give the current iPod Touch, iPod Nano and iPod Shuffle a smattering of new colours if an image found in the latest iTunes 12.2 version is to be believed. The image shows up whenever an iPod is connected to a computer with iTunes installed, and shows a deep blue Touch, a gold Nano and a dark pink Shuffle, colours that are currently not available. The iPod Touch is also missing the camera loop in the bottom left corner, and 9to5Mac has also managed to find images of all three models in all three colours. It’s not clear when the new colours will be released, but the calendar on the screen of the Touch says 'Tuesday 14th'. 9to5Mac has reported that Apple Stores are starting to run low on stock of Nano and Touch models, suggesting the new release isn’t too far away. Apple ceased production of the iPod Classic back in September 2014 after the launch of the iPhone 6, iPhone 6 Plus and Apple Watch.